Our colleague, Ken Reynolds, worked in the Provincial Archaeology Office (PAO) for more than 20 years and in that time visited large portions of this Province searching for archaeology sites. Many of the sites he found are only known within PAO records such as the site discussed in this post, South Arm 1. The area from Little Indian Arm and Winter Cove in the north to Charles Arm and Indian Cove to the south has seen its share of archaeology surveys. Much of that work is because the area is known to have been frequented regularly by the Beothuk. For example, Winter Tickle is the location of at least one Beothuk burial and is thought to be part of a Beothuk portage trail that allowed easy access between New Bay and Bay of Exploits. Charles Brook was the site of an English salmon fishing station in the late 1770s. In their first summer at the station, the English note that the brook had ‘…hitherto been constantly occupied by Indians…’ (Marshall 1996:65). 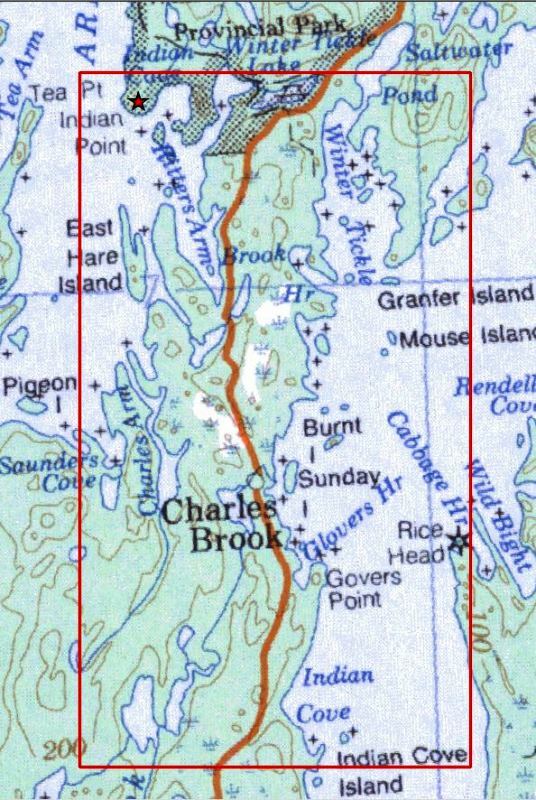 On his 1773 map of the Exploits River and environs, Cartwright depicts two conical habitation structures at the mouth of the brook (1996:90). In 1791 a Beothuk family was attacked on Charles Brook Pond by a group of Englishmen, they ‘…allowed two women to get away but shot a man, wounded a boy, and captured a girl, known as Oubee‘ (1996:11). In 1823 Captain Buchan asked John Peyton Jr. to return Shanawdithit, her mother and sister to the rest of the Beothuk on the Exploits River. However, according to John Peyton Jr., he delivered the women to Charles Brook ‘…and gave them a small boat. They appeared perfectly happy to be left there…’ (1996:187). As well, there is another known Beothuk burial on the north end of Charles Arm. 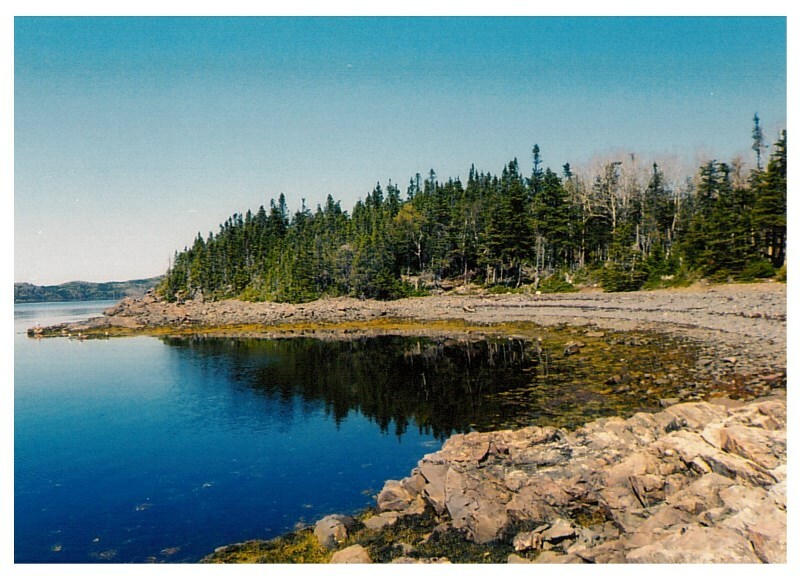 Finally, at Indian Cove, south of Charles Brook, Beothuk wigwams had been observed covered in European canvas sails and Christopher Pulling in 1792 recorded a Beothuk wigwam at Indian Cove with seven or eight sleeping hollows (1996:351). With this history in mind, it is clear why this area has seen several archaeology surveys starting in 1965 with Helen Devereux and continuing on with Callum Thomson in 1980, Fred Schwarz in 1992 and 1994 and six visits by PAO staff between 1999 and 2013. All of this work has resulted in the discovery of 12 archaeology sites that have Maritime Archaic, Palaeoeskimo, Recent Amerindian precontact components and historic Beothuk and European components as well. Interestingly, just two of the sites have a Dorset component which is a little surprising given that the Dorset are the most common precontact culture represented in the precontact record of the Island. During one of Ken’s visits to the area in 2003, he discovered an archaeology site with a possible Recent Amerindian component and a probable Dorset component. The site is located just outside Little Indian Cove, South Arm, New Bay (See the map below). South Arm 1 is the red star. The area under discussion is within the red rectangle. 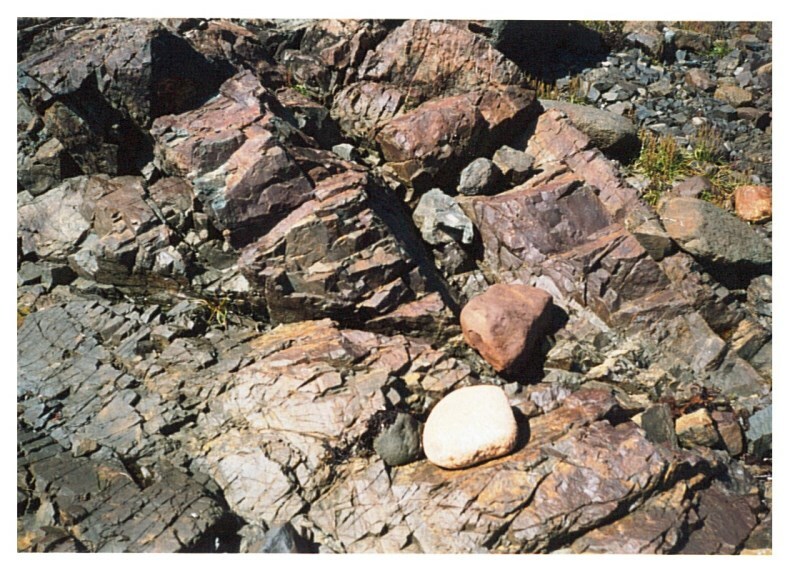 The site and a possible chert source were found during a brief survey of the Ritters Arm, Indian Cove, and Little Indian Cove areas. The site contains evidence of several hearths, a bone mash layer and at least two mounds that were not tested but may be cultural. Possible chert source found in Indian Cove. In total, five test pits were dug in as straight a line as was possible given the vegetation throughout the site. Each pit was approximately ~30 cm x 30 cm, one was ~40 cm deep, all the others were less than half that amount. All were positive for cultural material including formal artifacts, fire-cracked rocks, charcoal, and flakes (mostly secondary and retouch flakes). Test pit 1 had a black humus layer with fire-cracked rocks and charcoal. Seven flakes made from a variety of materials including quartzite were collected from the pit. Test pit 2 produced evidence of a hearth in the form of fire-cracked rocks, charcoal and red-tinged sand under the rocks and charcoal which most likely was caused by burning. Recovered cultural material included one endscraper and 56 flakes of various ‘local’ cherts and 1 of rhyolite. Test pit 2 flakes, rhyolite flake, and end scraper. Test pit 3 was the most eastern test pit which contained fire-cracked rocks and seven flakes. All the flakes were small and of various types of chert. Test pit 4 contained material from what may be considered a different culture. The pit had a number of fire-cracked rocks and a layer of bone mash within which 26 Ramah chert thinning flakes were recovered. Along with the flakes, one calcined bone fragment was collected. Further research will discover if this feature was the result of Palaeoeskimo activity or due to a second cultural component at the site, such as Recent Amerindian. Test pit 4 calcined bone (left) and Ramah chert flakes. 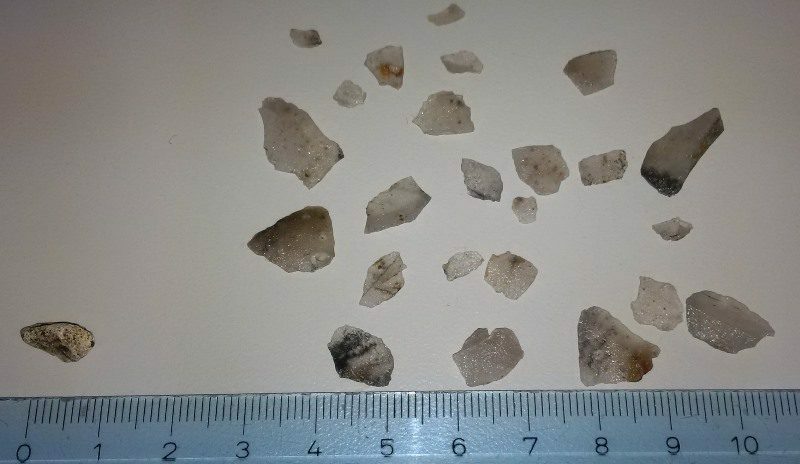 Test pit 5 was one of the more prolific test pits with three microblade fragments (one of quartz crystal), and 56 flakes recovered. The microblades indicate a Palaeoskimo component at the site, while the varieties of raw materials, patinated and non-patinated ‘local’ (Notre Dame Bay) cherts, and argillite, may suggest that the culture is Dorset. Test pit 5 flakes and microblades on the bottom right. Also noted in 2003 were two mounds on site that may be cultural in origin. Mound 1 was located near the rear of the terrace and measured 2 m by 60 cm wide and ~12 cm high. Its long axis was northwest-southeast. Small rocks could be seen protruding from the vegetation. Mound 2 was located 4 metres north of mound 1 and measured 1.10 m by 55 cm and ~ 16 cm high. Its axis was the same as the first. Neither mound was tested as this was an impromptu survey so it is not known whether they are natural or cultural in origin. In 2005 Ken revisited the site and dug two more test pits. Test pit 6 contained another 23 flakes and a scraper. Test pit 7 contained eight flakes, a scraper, a flake scraper and a possible tip flute spall which is further evidence to suggest a Dorset component. Lithics from Test pit 6 are in the box on the left. 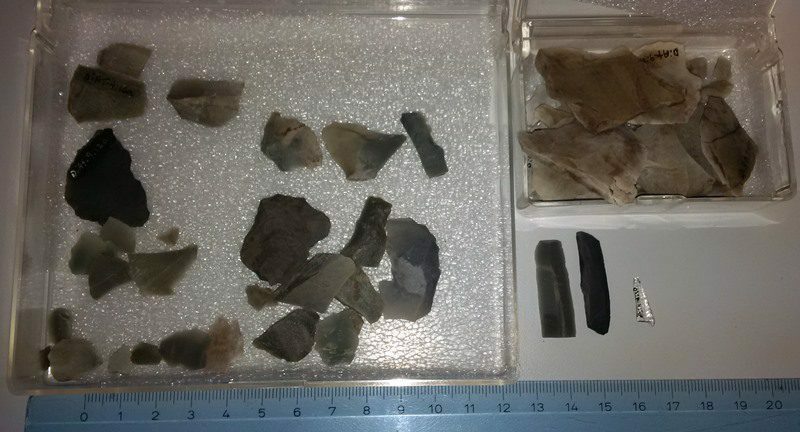 Lithics on the right are from test pit 7. To the far right is a flake scraper on top, a scraper on the left and possible tip flute spall on the right. More intensive testing is required to positively confirm Dorset usage of the site as well as the presence of other cultures. Site type, seasonality, temporal span and its relationship to other sites in Notre Dame Bay, especially its neighbour Winter Tickle 1, a large multi-component site, are all legitimate research questions for South Arm1. 1996 A History and Ethnography of the Beothuk.